Last Thursday, 7 Dec 2017, The Noakes Foundation & Eat Better South Africa successfully hosted its Low Carb Fundraising event as a launch to the Foundation’s new independent initiative, the Nutrition Network, an education and learning platform designed exclusively for medical practitioners and allied health workers across all disciplines, covering the most up to date science in the field of Low Carb nutrition. The learning platform will officially kick off with a 2 day Professional Training in LCHF / Ketogenic Patient Treatment on 9th& 10th February 2018. The evening kicked off with guests, which included, amongst others, a number of esteemed medical professionals, being treated to an array of low carb treats sponsored by our incredible group of affiliates. 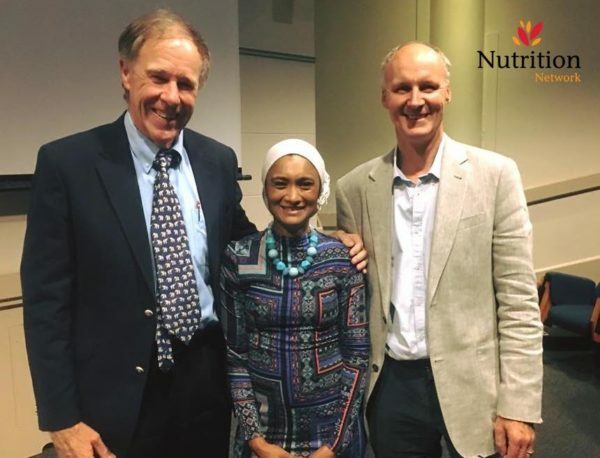 Thereafter, the audience was captivated by the exceptional line up of medical experts in the field of low carbohydrate diet viz Prof. Tim Noakes, Dr. Hassina Kajee & Dr. Neville Wellington. The three speakers are the founding doctors of the Nutrition Network platform, and their topics focused specifically on the scientific and medical perspectives of disease management using low carbohydrate diet and highlighted the dire need for medical professionals to take an active role in advocating low carbohydrate diets as an intrinsic form of chronic disease management. Prof Tim Noakes addressed the evolution of the nutrition over the last few decades highlighting the direct correlation between the increase in carbohydrates and sugar intake and the significant rise chronic disease. Dr. Hassina Kajee provided a heart-tugging personal account of the challenges faced as a specialist physician heading up the high care unit, treating the end stages of chronic disease, knowing full well that simple dietary changes could be the difference between life and death. Dr Neville Wellington focused on the impact of carbohydrates on insulin resistance and diabetes and provided accounts of remarkable improvements in blood sugar levels in his diabetic patients, proving without doubt, that a low carbohydrate diet is key in the management and prevention of type 2 diabetes. This confirmed the desperate need for professional training in LCHF / Ketogenic patient treatment for medical professionals and allied health workers – a need that the Nutrition Network will be addressing through its learning platform. Dr Wellington also presented a study funded by The Noakes Foundation, showing the impact of a low carb breakfast alternative on blood sugar levels compared to other ‘diabetic friendly’ breakfast brands. The study incontestably proved that the low carbohydrate breakfast option was most beneficial in managing blood sugar levels. The audience was also treated to a raffle, with the winners walking off with a personally signed copy of The Lore of Nutrition and banting goody hamper, generously sponsored by Banting Blvd and Mojo Me. All monies raised are allocated to Eat Better South Africa, the community-driven initiative of The Noakes Foundation aimed at providing nutrition education to under-resourced communities around South Africa. We wish to thank Prof Tim Noakes, Dr. Hassina Kajee, Dr. Neville Wellington, Jayne Bullen, Candice Spence, Banting Blvd, MojoMe, Probyo, Adapt, Leigh Wood, Gabriel and Kiara Van Wesemael, The Duchess Virgin Gin & Tonic as well as to all our guests for making the event a resounding success. Click here for more information about the upcoming Nutrition Network Professional Conference in February, or email nutritionnetwork@thenoakesfoundation.org for any enquiries.